YTO rotary drilling rig is applied in the drilling operations in the foundation constructions of roadway, bridge, and high-rise building, etc. 1 Our rotary drilling rig is characterized by high drilling torque, great axial compressive force, high working efficiency, easy operation, high reliability, good maneuverability, and so on. 2. It is usually designed with scalable Caterpillar base plate, automatic up-and-down foldable drill mast, extensible drill stem, and joy-stick control mechanism. 3. It uses logic controller to avoid misoperation. 4. Its monitoring system can monitor the working condition of the drill. 5. Furthermore, the key components of our rotary drilling rig are all purchased from well-known manufacturer. For example, its mast winch hydraulic motor and reducer, balance valve, traveling reducer and motor, rotating reducer and motor, combined hydraulic pump, multiple valve of auxiliary pump, power head motor, electromagnetic reversing valve and relief valve are all purchased from REXROTH. Moreover, this construction equipment uses original CUMMINS or CAT. engine, PAL-FIN processor, Italian HYDRO-CONTROL multiple valve of mast pump, Italian power head reducer, Italian BERCO undercarriage system, and PARKER oil filter. 6. The drilling machine is able to detect the drill depth and adjust the verticality automatically. 7. 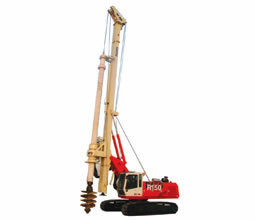 Our rotary drilling rigs are available in many models. Their maximum drilling depth can be 48m, 52m, 60m, 70m and 80m, and their mast tilting angle is 6°. For more parameters about our rotary drilling rig, please refer to the parameter table. As a China-based rotary drilling rig manufacturer, we strive to provide high quality, low priced rotating drilling rig and other construction machinery to our customers. In order to do so, we strictly apply ISO9001:2008 and ISO14001 international standards and implement strict quality control measures in the production. With our efforts, our rotary drilling rig, bulldozer, pickup truck, trailer, and other products are highly sought after by consumers in many countries. If you would like more information about our products, please email or call us.